Interior design and architecture go hand-in-hand as designing the interior of a space is pivotal in highlighting its architectural vision. While you may salivate over the interiors of Nate Berkus, Ashe + Leandro, Estee Stanley, or Kelly Wearstler, do you know who truly paved the way for the profession today? These interior designers are the most significant masters of the craft as the genuine founders of the profession and they’re the names that every design-lover should know. Elsie de Wolfe, born in New York City in 1865, was a professional actress who by 1887 was sharing her life with renowned literary agent Elisabeth Marbury. De Wolfe successfully redesigned the interior of the Irving Place house she shared with Marbury, which lead to a commission to decorate the Colony Club, New York City’s first social club exclusively for women. Going on to work on projects for Condé Nast, the Fricks, and the Hewitts, de Wolfe pioneered an anti-Victorian style which is still revered today. Paris in the 1930s was a jubilant and thriving city and Jean-Michel Frank ultimately took inspiration from his surrounds, making him the most renowned designer of the era. Frank had an eye for combining minimalist and maximalist design elements and as a furniture designer he would often show restraint in the shapes created, but would then finish the piece with a flourish of opulence. By mastering a successful marriage between glamour and functionality – much like online pokies – Albert Hadley was known as the ‘dean of American decorators’ and boasted names such as Rockefeller, Astor, Getty, and Mellon amongst his list of clients. With a strong design philosophy of “never less, never more”, Hadley successfully incorporated a mixture of design styles owing to his incredible sense of balance. Born Dorothy May Kinnicutt in 1910, Sister Parish opened her first interior design shop in 1933 in Far Hills, New Jersey. Her design style was a direct response to her father’s collection of antiques and Parish favoured a country aesthetic instead, complete with glazed chintz, quilts, and overstuffed armchairs. Her designs were warm and elegant, but she was known for her unforgiving assessment of the space and exacting tactics. A cousin of Sister Parish, Dorothy Draper has been attributed with opening what is arguably the first official interior design business, Architectural Clearing House, in 1925. By extending her delicate style of modern Baroque to many public buildings such as the San Francisco hotels the Fairmont and Mark Hopkins and the Greenbrier in West Virginia, Draper was quickly renowned for her colourful and cheerful spaces. The career of David Hicks – born 1929 in Essex – was launched when a magazine published an article about the redesign of his mother’s house in London. 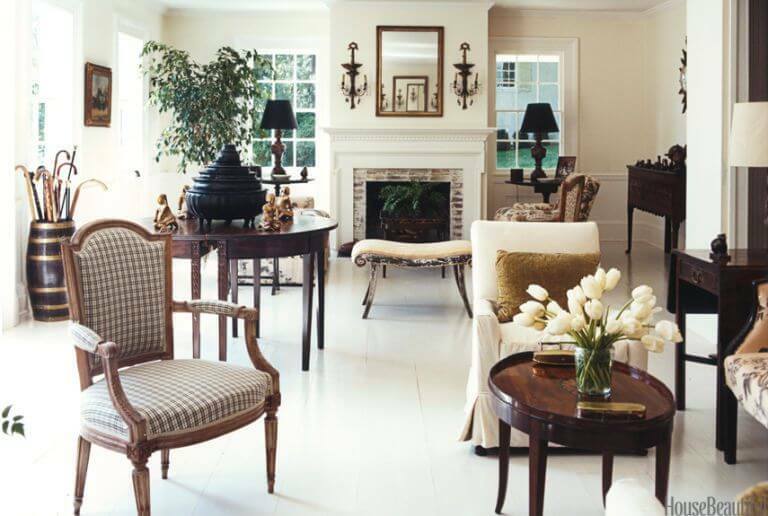 Hicks abhorred the stuffy decorating of traditionally old English homes and instead incorporated different colours, patterns, and period piece furniture to create a successfully cohesive look which could quickly have looked conflicting if not for Hicks’ deft hand and keen eye for design.